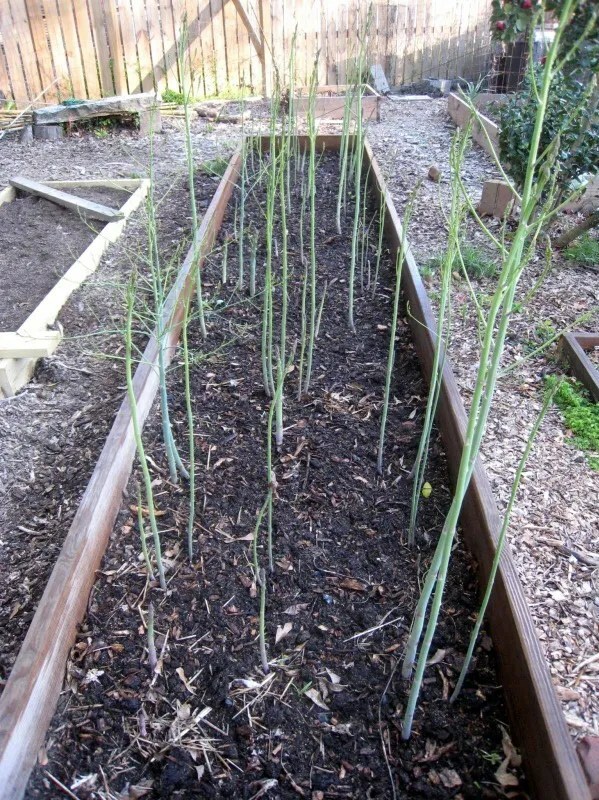 In this 2nd year of the asparagus bed, we could cut a spear or two but have (so far) decided not to cut any. The idea is to let the bed become as firmly established as possible so that we can enjoy the harvest to its fullest extent over the next 15+ years. We were pleased when the spears started appearing a few days ago; I spread a good 1-2″ of year old composted dairy cow manure over the entire bed earlier so the “ferned out” plants should enjoy plenty of nutrients this year. 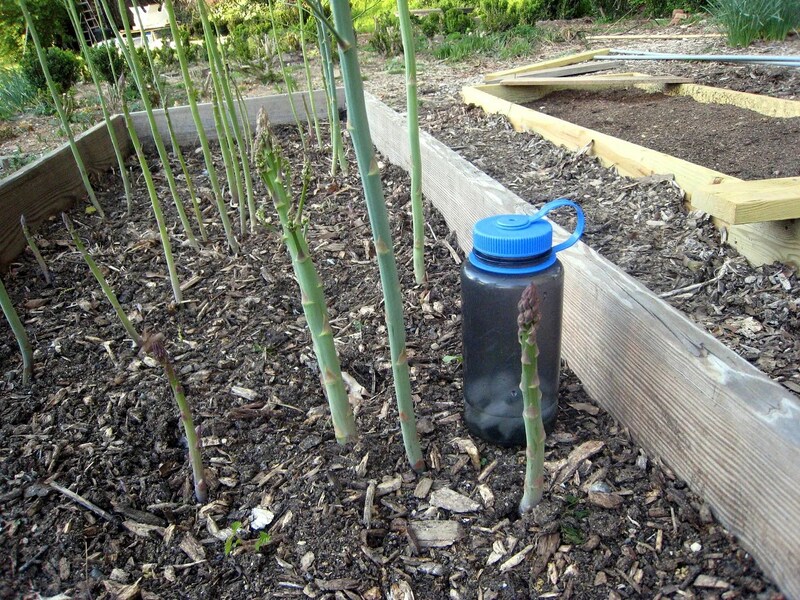 When I returned from an overnight business trip this evening I surveyed the garden and was surprised at how much the asparagus had grown over this period. 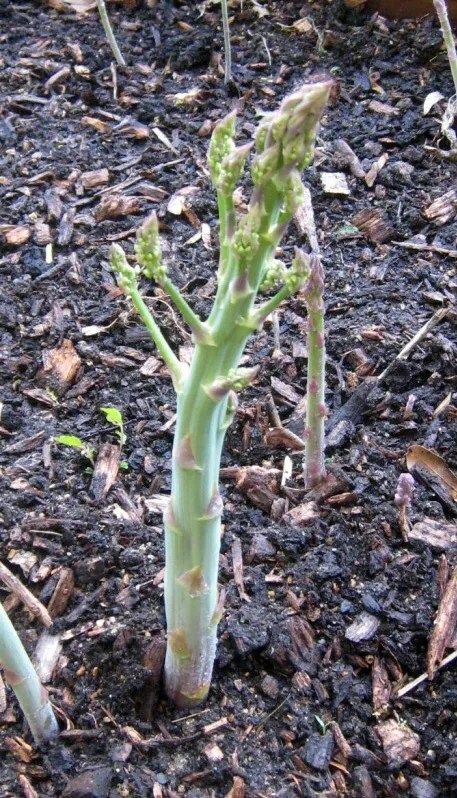 One particularly stout spear had prematurely started flowering out about a foot up (vs 2-3′ normally) and might be the homeliest asparagus spear on record in north Georgia. Does anyone else see the resemblance or is it just another manifestation of a malfunctioning cohutt brain again? Some of the growth this year is already taller than the tallest of last year and I’m concerned about the footprint that the mature and flopped plants will occupy this year. I’m planning on constructing a para-cord restraining corral of sorts this weekend if I am so motivated you’ll all be the “second to know” after it passes the scrutiny of Mrs cohutt. I’m always glad to see that you’re keeping yourself properly entertained out there in your own private Idaho! The video was great. I saw these guys at the Fox sometime close to when the video was made probably. ………………definitely brought back a memory or two! Get outta that state you’re in!!! !